The best Broccoli Cheese Vegan Pizza is here. It’s made from just 6 ingredients and in 2 easy steps. A satisfying, filling, and comforting plant based meal. Start with steaming the broccoli for around 5 minutes in a microwave, or simply cook it. While the Broccoli is cooking, prepare the sauce by combining vegan cheese sauce and all the other ingredients. Adding nutritional yeast is optional but will give the sauce an absolutely delicious extra punch. 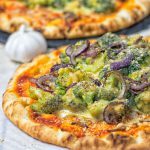 Finally, combine the broccoli, sliced onion and vegan cheese sauce in a bowl, give it over your favorite pizza crush, garnish with vegan Parmesan. Then bake for around 12 minutes at 410°F and enjoy! One serving is 1/2 pizza!